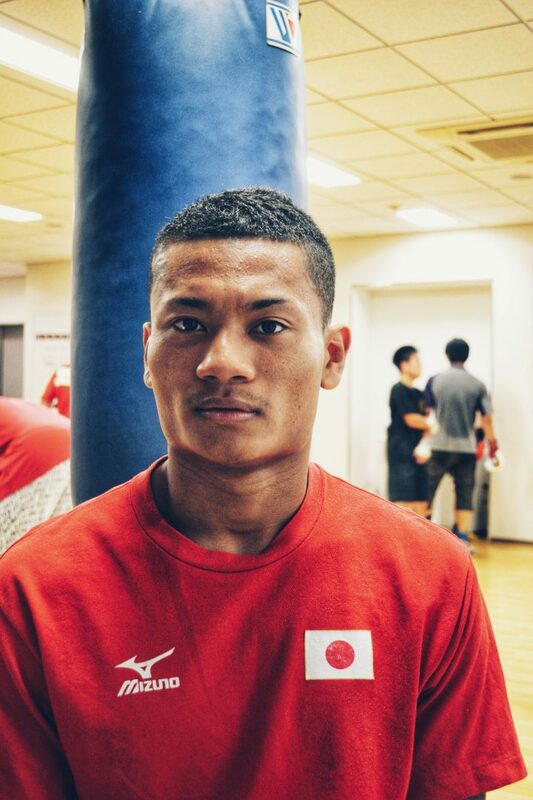 By Rishad Marquardt: This is a story about a young Japanese boxer who most readers would never have heard of before, Andy Hiraoka. Andy was born and raised in a small suburb of Yokohama, Japan. Yokohama is best known for its picturesque bay, the trendy hipster atmosphere in which young people explore the delights the city has to offer under its neon lights at night, and it’s nearby US naval bases. But Asahi, the suburb of Yokohama where Andy is from, doesn’t quite muster up the same image. The nondescript residential area on the outskirts of the city was where Andy was born and raised. Now, 21 years of age, and currently an undefeated professional boxer with a record of 12-0, eight of those coming by way of knockout, is tall, muscular, and handsome, making it hard comprehend his childhood as being a time in which he was insular, shy, and bullied at school. Born to a Japanese mother and a Ghanaian father, Andy looks very different to most other Japanese people and yet he is quintessentially Japanese. He speaks softly and politely, is humble and gracious, treats people around him with respect, and doesn’t show any signs of being flashy. “When I was younger I wasn’t that good at making friends and because I looked different to the other kids, I often encountered bullying at school. I was always conscious of people what people were saying and thinking about me.” Japan is one of the most homogeneous countries in the world with Japanese nationals making up approximately 98.5% of the population, with a further one percent being made up by Chinese and Koreans, leaving the remaining small portion made up of ‘all the rest’. In other words, the less East-Asian you look, the more you stand out. Naturally the further away you go from the central metropolitan areas, the stronger the sense of isolation becomes. My first impression of Andy as I sit down with him for this interview is that he comes across as being quite shy. “Shy?” he says with a big smile, “yes, I think that’s true, I think I’m quite a shy person.” It must have been difficult for an introverted young man growing up in an environment in which he would have stood out like a sore thumb. “It wasn’t easy”. As well as feeling isolated as a youth, Andy experienced another struggle in the form of the strict upbringing he had from his father. From the age of four, Andy’s father, Justice, introduced a regime of boxing training into his life. ‘There were times I really didn’t want to do it, but my father insisted and so it was a struggle that I had to persisted with until around the age of 11 or 12, that was the age I started to train on my own accord.” I asked about the relationship he had with his father then, and the role his mother played in his upbringing. “If my father was the fire in my life then my mother was the water. When he was tough on me my mother would be there to console me, together they provided a balance in my upbringing”. At Andy’s last fight in February 2018 at the Korakuen Hall on the undercard of the Ryo Matsumoto vs Daniel Roman fight, Andy came out to a huge reception with great support from the Ohashi Gym fans. This is the same gym where Naoya Inoue, one of the best pound for pound fighters on the planet also trains. Looking around the gym I sense Andy is happy with his surroundings. Andy’s father who has been training his son since the age of four was also in the gym, speaking fluently in Japanese to other fighters, giving them pointers. He graciously responded to my request to speak with him about his son. I soon realised he was a man with many stories. Born and raised in Ghana, Justice Codjoe has spent time in many different countries including the US where he met Andy’s mother. According to Justice, he himself was a boxer in Ghana, a country renowned for its ability to churn out world champions, and even came up with the great Azumah “The Professor” Nelson. He claims that they trained in the same gym when they were both amateurs but before a major international tournament, there was an internal dispute involving management that meant Justice wasn’t able to go and represent his country. “Azumah came back with a gold medal. I’m not saying that if I went that I would have become a successful professional boxer, but there you go”. I asked him how he found himself in Japan and got an unexpected response. “When I was younger, I vividly remember having this dream. In the dream, I was an old man and I had my own boxing gym in the far-East”. He mentioned at the time he had little knowledge of the far-East but for some reason, it was a dream that stuck with him. “When I was with my wife, who I met in the US, she talked about going to Japan”. He moved over here and ended up three children; two daughters, and his son Andy. Justice has spent time across the continents of Africa, Europe, America and Asia. He has the face of a wise man who has had many experiences. I asked him if being strict with his son from a young age was difficult for him to do. He said, “You know, having and raising a child is like making a pot from clay. You have to mold it with your hands to get it into the ideal shape, but you can only do this in the beginning when the clay is still soft. When he rebelled and didn’t want to train, I told him ‘you don’t want to train now but one day you will understand. Now, he understands”. I asked Andy about his ambitions and goals. ‘To be honest becoming a world champion is not the goal in itself for me. Of course I want the belt wrapped around me, but most of all I want to repay my parents, the people who supported me’. Whether or not he will make it in the game of boxing remains to be seen. He has a lot to prove and has yet to fight at an elite level, so gauging his potential is tricky. I did, however, get an understanding of what one of his biggest backers is expecting from him. Before starting the interview, I was outside the gym, waiting to cross the road when a gentleman in a suit stepped to the crossing beside me, waiting for the light to turn green. By chance, it was Ohashi himself. I struck up a conversation with him and told him I was visiting to interview his fighter. “Andy, eh. Let me tell you, that boy is strong.” He didn’t sound like he was marketing, he spoke with conviction. “I really feel like he is going to be a world champion one day”.